Located at the seashore two kilometers south from Budva and practically connected with the small fishermen settlement Rafailovici, is situated town called Becici. Two thousand meters long Becici Beach was pronounced in 1935 the most beautiful beach of the Mediterranean by the Parisian experts. Because of the long, sandy beach, calm sea and the abundance of beach amusement Becici is ideal place for family holidays. At clients’ disposal there is a beach service as well as accessories for water sports, tennis and basketball courts, volleyball grounds, mini-golf terrain etc. 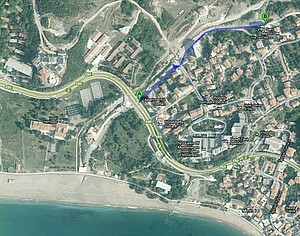 Villa San Marco*** is situated in Becici, near the hotel “The Queen of Montenegro” and cca 400 meters far from the beach. 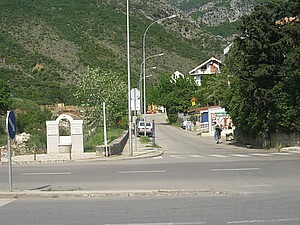 Villa is located on a slight elevation above sea level. Nights here are very pleasant and slightly chilly. Villa is located in the most peaceful part of that beautiful sea town and is suitable both for rest and for joy of all generations. 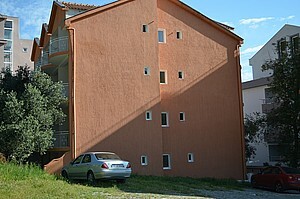 Total capacity of villa is 36 studios, three floors and without an elevator. 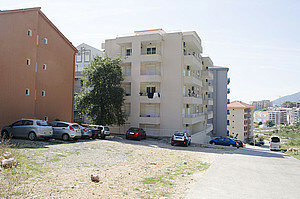 All studios have the individual air conditioning (included in the price). We offer free parking place for our guests. Studio 1/2 has double bed, and studio 1/2+1 has also extra bed (chair that opens) for the children or the third person, bathroom (with the shower), kitchen, CATV, AC, Wi-Fi internet is available in all rooms and is free of charge and big balcony with the table and chairs. The kitchen is well equipped and there is also dishes and cutlery available for use. If needed, you can take a studio with a crib in the ground floor. Cleaning and bed linen change in studio is every 5 days, if you stay more 10 days. Frequent cleaning is possible (extra charge). The maid does not enter in the room during the stay of guests, except on their own request. There are towels for personal hygiene in the studio. Maintenance of hygiene in the studio during the stay is the responsibility of passengers. We offer a laundry service also. For all our guests we provide transport services from the airport in Tivat and Podgorica to the villa, it is need to book the day before arrival (transportation services are paid on the spot and is 20Eur from Tivat and 40Eur from Podgorica). For the bicycle fans we can rent bicycle in the villa. We invite you to visit us so that you can experience and enjoy in the quality of our services. NOTICE: In the studio 1/2+1 can stay maximum 3 adults or 2 adults with 2 children up 10 years. in advance 30% and the rest 10 days before the start using the services. Pricelist no. 1 from 13.12.2017.